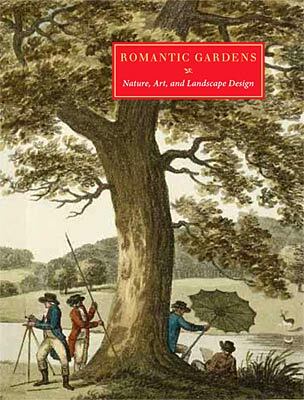 Cover of Romantic Gardens: Nature, Art, and Landscape Design (David R. Godine Publishers, 2010). This publication accompanies an exhibition on the influences of the Romantic movement on styles of landscape design in England, France, Germany, and the United States. Beginning with the reaction to the geometrically designed gardens of the seventeenth century, it traces developments in theory and practice as well as the increasing prestige of the landscape design profession, along with poetry and painting. More than simply a catalogue, the proposed publication recounts the publishing history of landscape albums, some of them frequently cited by scholars working in this field, and their role in the transmission of stylistic ideas. Elizabeth Barlow Rogers, president of the Foundation for Landscape Studies, is the author of The Forests and Wetlands of New York City (Little, Brown and Company, 1971), Frederick Law Olmsted's New York (Whitney Museum/Praeger, 1972), Rebuilding Central Park: A Management and Restoration Plan (MIT Press, 1987), Landscape Design: A Cultural and Architectural History (Harry N. Abrams, Inc., 2001), and Romantic Gardens: Nature, Art, and Landscape Design (David R. Godine, 2010). In addition to serving as a life trustee of the Central Park Conservancy, she is the recipient of the Rockefeller Foundation's Jane Jacobs Medal for lifetime achievement (2010), a fellow of the American Academy of Arts and Sciences, and a member of the boards of the Battery Conservancy, the Library of American Landscape History, and the Regional Plan Association. She is a member of the advisory board of the National Association of Olmsted Parks, an honorary member of the American Society of Landscape Architects, and a recipient of the Society's LaGasse Medal (2005). In 2010, she received the Green-Wood Historic Fund's Dewitt Clinton Award in Arts, Literature, Preservation, and Historic Research. The mission of the Foundation for Landscape Studies is to foster an active understanding of the importance of place in human life. The organization was founded in 2005 to teach the intrinsic value of all places by virtue of their natural features, environmental qualities, design, cultural history, and present use. The FLS sponsors scholarship through the David R. Coffin Publication Grant and public outreach through the publication of the journal Site/Lines. It collaborates with organizations such as the Society of Architectural Historians on the development of digital resources in order to make cultural landscape images and information available to students and educators. It works with institutions such as the Morgan Library and Museum on exhibitions displaying rare books, prints, manuscripts, drawings, and photographs in order to increase public awareness of historic and contemporary landscapes.